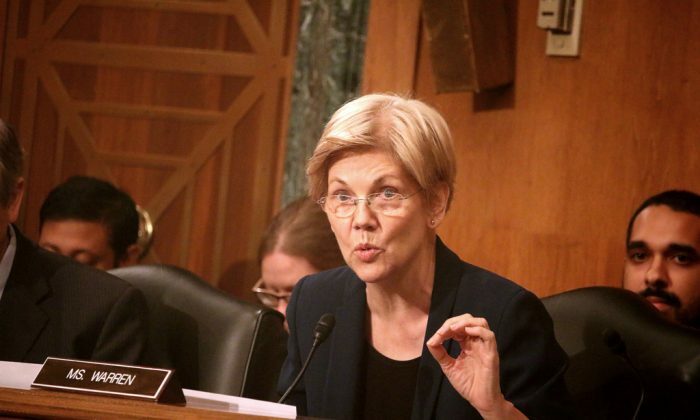 WASHINGTON—The senators on the Senate Banking Committee in bipartisan unity denounced the sales culture at Wells Fargo Bank, and, in general, the breach of trust that is fundamental between a bank and its customers. Investigations by the LA Times, the Los Angeles City Attorney and federal regulators found that some employees opened about two million accounts—deposit and credit card—that may not have been authorized or wanted. You read that right—two million violations of customers. For the credit cards, they used customer information without their knowledge or consent. Some customers incurred fees due to these actions. These activities have been ongoing since at least 2011. This article got the attention of the Office of the Comptroller of the Currency (OCC), the bank’s principle regulator, the LA Attorney office, and, later, the Consumer Financial Protection Bureau (CFPB). The OCC became aware of complaints alleging improper sales practices at Wells Fargo from consumers and bank employees earlier in March 2012, but was slow to take action. Wells Fargo Chairman and CEO John Stumpf testified under oath at a hearing on Sept. 20. He went through a gauntlet of harsh criticisms for the way Wells Fargo & Co. has handled the sham accounts and harm done to customers. The senators as a whole were exasperated that Stumpf and Wells Fargo senior management have taken so long to fix the problem and seemingly did not act until lawsuits and federal regulators were pressing them. Several senators also voiced strong misgivings that Wells Fargo customers would be compensated for all their monetary losses. What unnerved several senators was that no one from Wells Fargo senior management has been fired or penalized for many years of fraudulent conduct on a massive scale. Placing the bulk of the blame on low level employees’ misconduct was not persuasive to them. While other banks strive for three, Wells Fargo aimed for eight accounts, and led the banking industry. Over the course of five years 2011-2016, Well Fargo terminated about 5,300 employees, and has agreed to pay a total of $185 million in fines. The Consumer CFPB is responsible for $100 million of this fine, which is the largest in its history. The CFPB joined with the Los Angeles Attorney’s office and OCC on Sept. 8 to issue an enforcement order against Wells Fargo after their respective investigations uncovered the misconduct, which some say was fraud. While other banks strive for three, Wells Fargo aimed for eight accounts, and while it didn’t actually average eight, it led the banking industry. This activity in the banking world is called “cross-selling” of financial products, such as checking and savings accounts, credit cards, mortgages, and overdraft protection. The philosophy behind it is that more accounts bind the customer to the bank, making the customer less likely to switch to a competitor. Multiple accounts also generate more fees. Indeed, during the five year period of intense selling from 2011 to 2016, the Wells Fargo (NYSE: WFC) share price shot up from $25.91 on Oct. 1, 2011 to $57.87 on July 1, 2015, or about $32 a share. A few senators accused the company of promoting the fraud to boast growth and increase the price of its shares. Since the announcement of the enforcement order on Sep. 8, the stock has dropped down 2.3 percent (to $45.72 on Sep. 23, 2016) and the firm’s market value has dropped about 6 percent to $230.45 billion. Until overtaken this month by J.P. Morgan Chase & Co., Wells Fargo was the nation’s biggest retail bank, according to Bloomberg. You squeezed your employees to the breaking point so that they would cheat customers and would drive up the value of your stock and put hundreds of millions of dollars in your own pocket. In a vitriolic and indignant tone of voice, Massachusetts Democratic Senator Elizabeth Warren berated Stumpf. Holding the phone transcripts from 2012 to 2014 in her hands, Warren said Stumpf made a strong pitch in quarterly reports to investors on the importance of cross-selling. Each quarter he touted the product ratio which reached 6.17 per household in April 2014. Warren said that he owned 6.75 shares of Wells’ stock and that the stock had risen about $30 (as noted above); so he personally gained more than $200 million. “You squeezed your employees to the breaking point so that they would cheat customers and would drive up the value of your stock and put hundreds of millions of dollars in your own pocket,” she said. She told him that he should resign and give back the money he made while the “scam” was going on. For his part, Stumpf defended himself and Wells Fargo senior management by denying there was an “orchestrated effort” by the company. He said whenever their internal investigations found an employee creating an account and funds it to make it look like the customer had funded the account, the employee was terminated. He said the employees terminated had “violated the company’s code of ethics, were dishonest, and did not honor our culture.” “The vast majority did the right thing,” he repeated several times. He played down the magnitude of the wrong done by pointing out that the number terminated in any one year was only 1 percent of the total sales retail group. He angered the senators for dismissing the seriousness of what transpired as only creating accounts that people didn’t want. Senators Brown, Robert Menendez (D-N.J.), Patrick Toomey (R-Pa.) Dean Heller (R-Nev.), Joe Donnelly (D-Ind.) and Tim Scott (R-S.C.) said it was outright “fraud,” and many implied the bank had a lot to gain until it was caught. “Wells Fargo’s reaction is remarkable. It did not treat this as a big problem until it appeared in the newspaper. It did not begin to make customers whole until this year. And we do not know whether the bank chose to do so, or was told to do so,” said Brown. Stumpf said multiple times that Wells Fargo would make everything right with their customers, and plans were in place to do just that. However, Sens Jon Tester (D-Mont. ), Crapo (R-Ind. ), Scott, and Joe Donnelly (D-Ind.) were dubious that Wells Fargo would be able to fully correct the negative information sent to the credit bureaus as a result of falsely opened credit cards and fees assessed. “The impacts of these are far, far more than the fines and fees associated with that,” said Tester. A half of one percent increase in interest for one’s mortgage could end up costing $50,000 over 30 years, he said. Stumpf was asked when he became aware of the problem of sham accounts and other malfeasance. In 2011, one thousand employees had been terminated for unethical behavior, but in a firm as large as Wells Fargo with 268,000 employees, it may not have been obvious that there was a systemic problem. The Times article appeared on Dec. 22, 2013. Stumpf said he learned about the problem some time in year 2013, and before that article. Yet, if he learned about the problem in 2013, why did it take till August 2015 to bring in consulting firm PricewaterhouseCoopers to identify the customers who had suffered financial harm, and get a measurement of the extent of total damage? “We recognize now that we should have done more sooner to eliminate unethical conduct or incentives that may have unintentionally encouraged that conduct,” Stumpf said. No one on this committee believes that 5,000 people act alone with impunity and with dishonesty. After reaching agreement in August 2016 with the LA Attorney office, OCC and CFPB, Wells Fargo will eliminate all product sales goals for retail banking, effective January 1, 2017. In addition, authorizing a new credit card now requires a physical signature or some other documented applicant consent. Sens. Shelby, Brown, Bob Corker (R-Tenn.), Patrick Toomey (R-Pa.), Dean Heller (R-Nav. ), Donnelly, and Warren criticized the way Wells Fargo has handled the recent announcement of retirement of Carrie Tolstedt, who was in charge of retail operations until July, led the bank’s cross-selling of multiple accounts, and oversaw the firing of the 5,300 employees. Tolstedt, 56, who served the company 27 years, is retiring at the end of the year and walking away with a retirement package worth $124.6 million in stock, options, and restricted Wells Fargo shares, according to Fortune. Brown declared that Tolstedt deemed it not important enough to alert Stumpf or the board for two years despite the firing of thousands of employees. She continued to be the recipient of praise and performance bonuses until as recently as two months ago, he said. Brown thought the contrast between Tolstedt’s treatment and the termination of $12 an hour employees was unfair and appalling.